Well it's been a long time since I've written about anything that I've done. With all the social media out there the blog has kind of fallen by the wayside for a bit. But I'm back and ready to go with a new project for a monthly challenge. This month's, November, challenge is put on by Lindy's Stamp Gang. They make these awesome sprays in both micas and flats. Every month they put together a pallet of spray/embossing powder colors inspired by a picture. The challenge to create something using these sprays/powders. I saw this months picture and color pallet and was immediately inspired. How could you not be, I mean it's a lovely picture with a gorgeous pallet. I figured out where I was going to add my fussy cut out things. 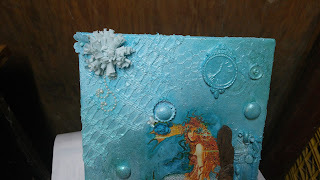 Then I added some texture paste, cut up doilies, sand paste and then gessoed it. 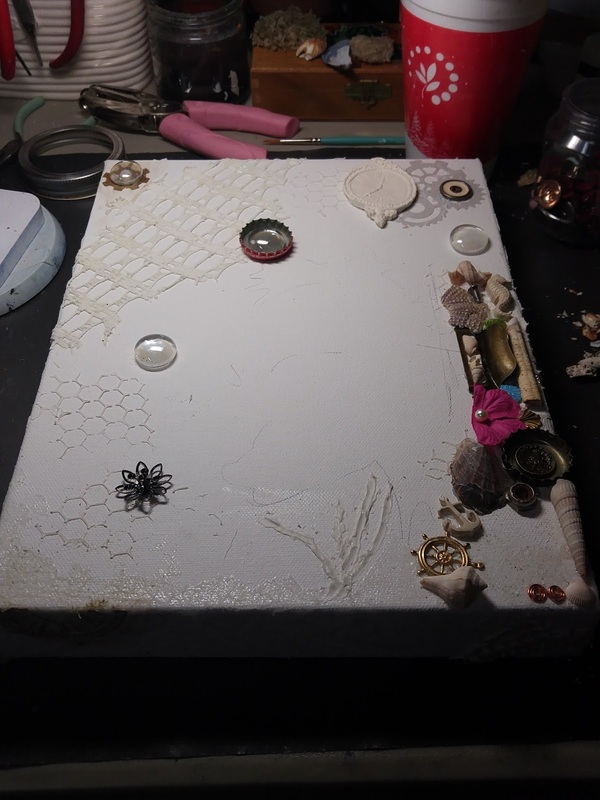 I added some found items, and cameo cuts. 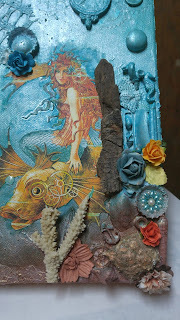 I even molded some bits from paper clay using a IOD and Martha Stewart mold. 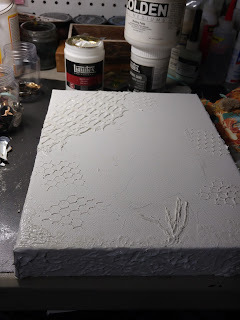 After gluing everything down it all got coated with 3 layers of gesso. 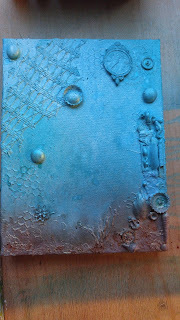 Once dry I sprayed it with an array of Lindy's sprays. 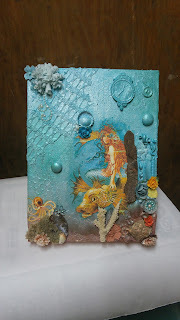 Then I had to add my fussy cut out paper and lots more embellishments. I went back in around the mermaid with some of the sprays and a paint brush to give it the look of the water being darker and to add some color to her hair and fins. 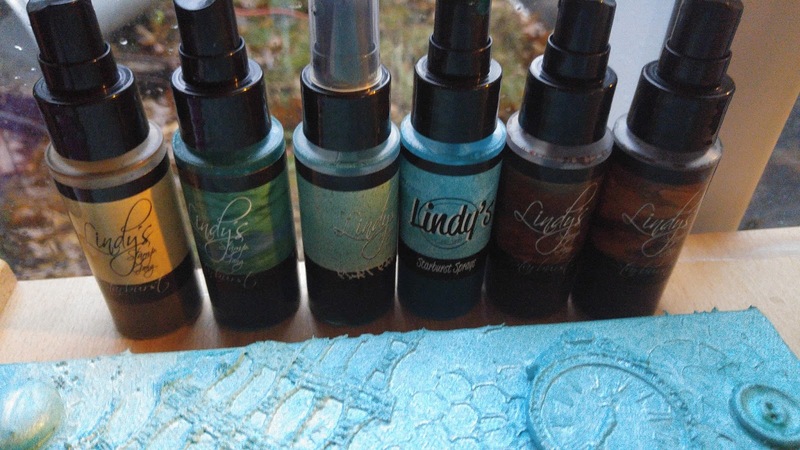 Lindy's Stamp Gang Sprays - Jack in the Pulpit Teal, Sassy Sapphire, T-bird Turquoise, Cajun Carnelian Red, Cocoa Bean Copper, Opal Sea Oats. Beautiful! 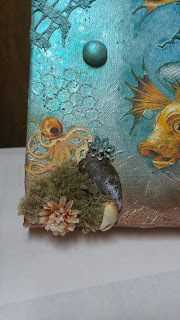 I love this sea canvas! Thank you for joining at Lindy's stamp gang! 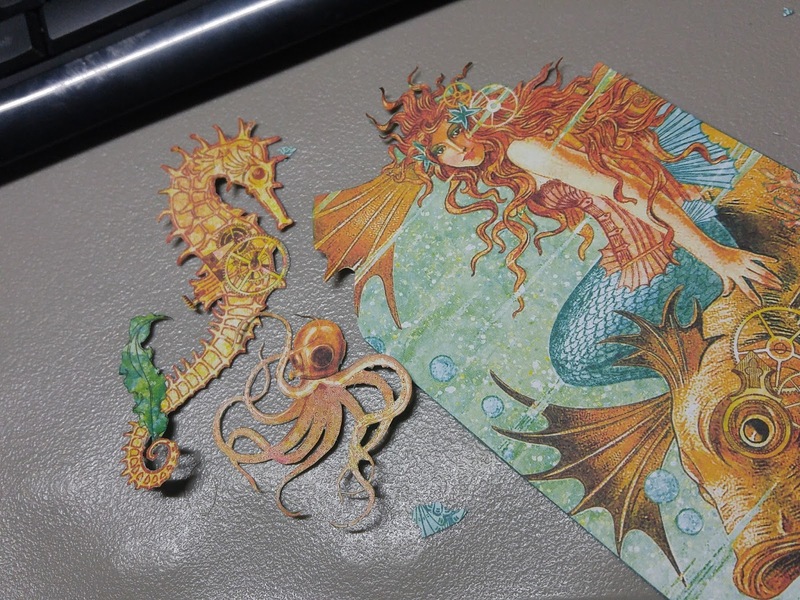 Thank you for playing along with us at Lindy’s Stamp Gang!